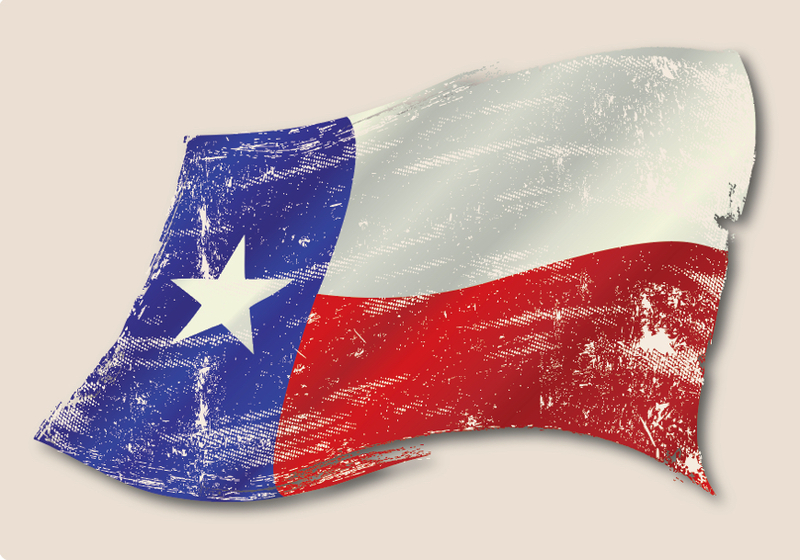 Texas continues to grow faster than the U.S. The state gained 268,800 nonagricultural jobs from February 2018 to February 2019, an annual growth rate of 2.2 percent, higher than the nation's employment growth rate of 1.7 percent (Table 1 and Figure 1). The nongovernment sector added 256,000 jobs, an annual growth rate of 2.5 percent, also more than the nation's employment growth rate of 1.9 percent in the private sector (Table 1). Texas' seasonally adjusted unemployment rate in February 2019 was 3.8 percent, lower than the 4.1 percent rate in February 2018. The nation's rate decreased from 4.1 to 3.8 percent (Table 1). 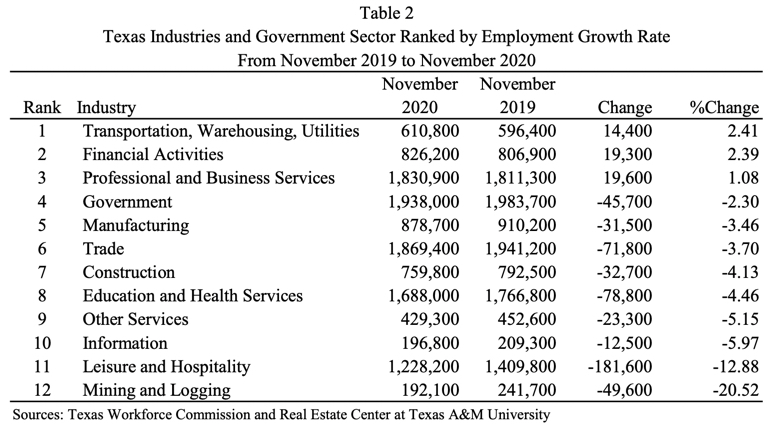 Table 2 shows Texas industries ranked by employment growth rate from February 2018 to February 2019. All Texas industries except the information industry had more jobs in February 2019 than in February 2018. The mining and logging industry ranked first in job creation followed by manufacturing; transportation, warehousing, and utilities; construction; other services; leisure and hospitality; and professional and business services. Figures 2 to 13 (shown in full report) show trends in employment growth rates by industry. 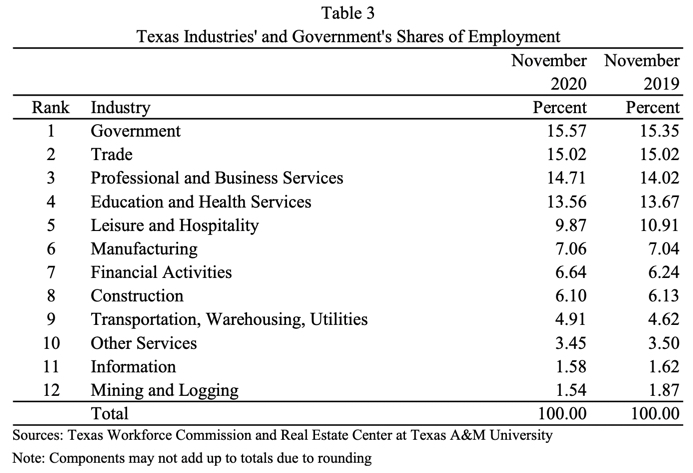 Table 3 shows Texas industries and the state's government sector ranked by their shares of Texas jobs in February 2019. Of the 12,662,400 nonagricultural jobs in February 2019, the highest percentage of employment by industry was in the government sector followed by the trade, professional and business services, education and health services, leisure and hospitality, and manufacturing. 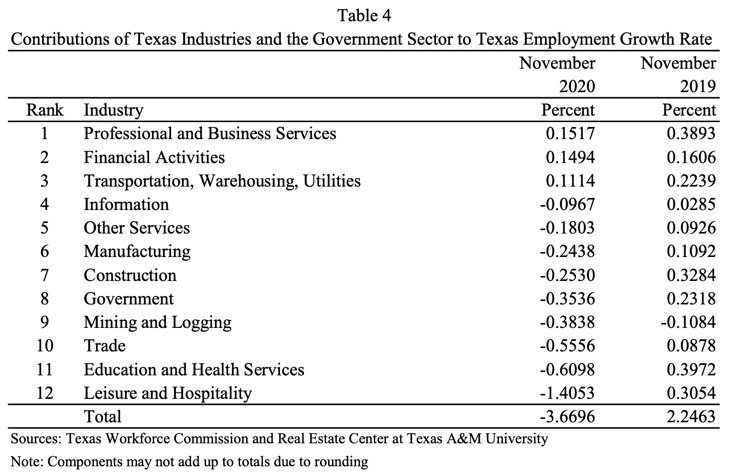 Since February 2018, professional and business services; leisure and hospitality; manufacturing; construction; transportation, warehousing, and utilities; other services; and mining and logging have expanded their shares of Texas employment at the expense of the government sector, trade, education and health services, and the information industry. Figures 14 to 25 (shown in full report)​ show trends in shares of total Texas jobs by industry. Texas' statewide employment growth rate of 2.2 percent, or more exactly 2.1689 percent, from February 2018 to February 2019 is the weighted average of employment growth rates for all Texas industries for the period. Weights are shares of jobs by industry. The contribution of each industry to the statewide employment growth rate is equal to the employment growth rate of that industry multiplied by its share of Texas jobs. Table 4 shows Texas industries and the state's government sector ranked by their contributions to Texas employment growth rates from February 2018 to February 2019. The state's professional and business services ranked first in contribution to job growth followed by leisure and hospitality, education and health services, manufacturing, trade, construction, and mining and logging. Figures 26 to 37 (shown in full report)​ show trends in contributions of Texas industries to Texas job growth rates. All Texas metro areas had more jobs in February 2019 than in February 2018 (Table 5). Midland ranked first in job creation followed by Odessa, Dallas-Plano-Irving, College Station-Bryan, Houston-The Woodlands-Sugar Land, and Sherman-Denison. Figures 38 to 63 (shown in full report)​ show trends in annual employment growth rates for the state's metropolitan areas. 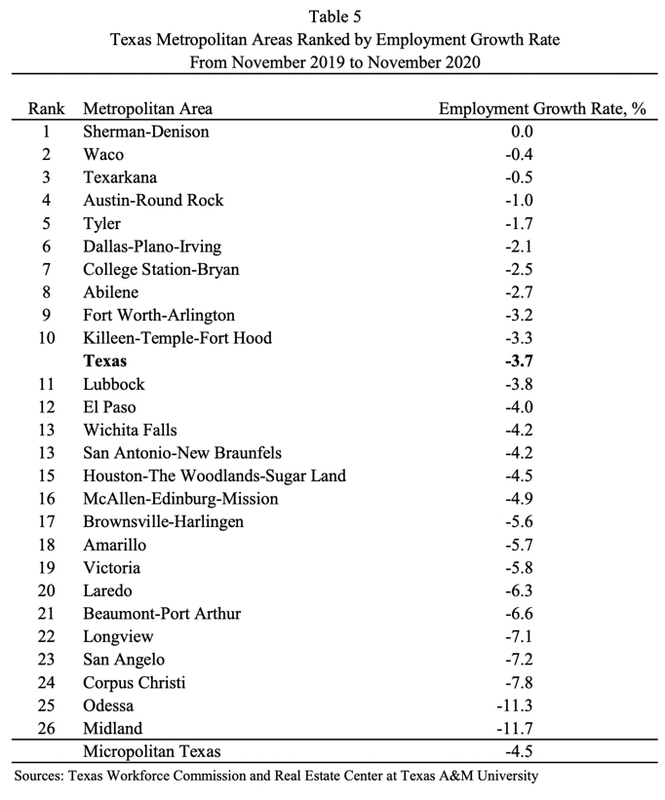 Table 6 shows Texas metropolitan areas ranked by their shares of total Texas jobs in February 2019. Houston-The Woodlands-Sugar Land had the largest share of Texas jobs followed by Dallas-Plano-Irving, Austin-Round Rock, San Antonio-New Braunfels, Fort Worth-Arlington, El Paso, and McAllen-Edinburg-Mission. Figures 64 to 89 (shown in full report)​ show trends in metropolitan shares of total Texas jobs. 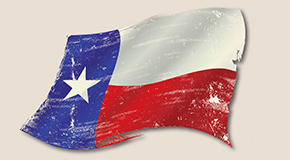 The statewide employment growth rate of 2.1689 percent in Texas from February 2018 to February 2019 is the weighted average of employment growth rates of all Texas metros for the period. Weights are shares of jobs by area. 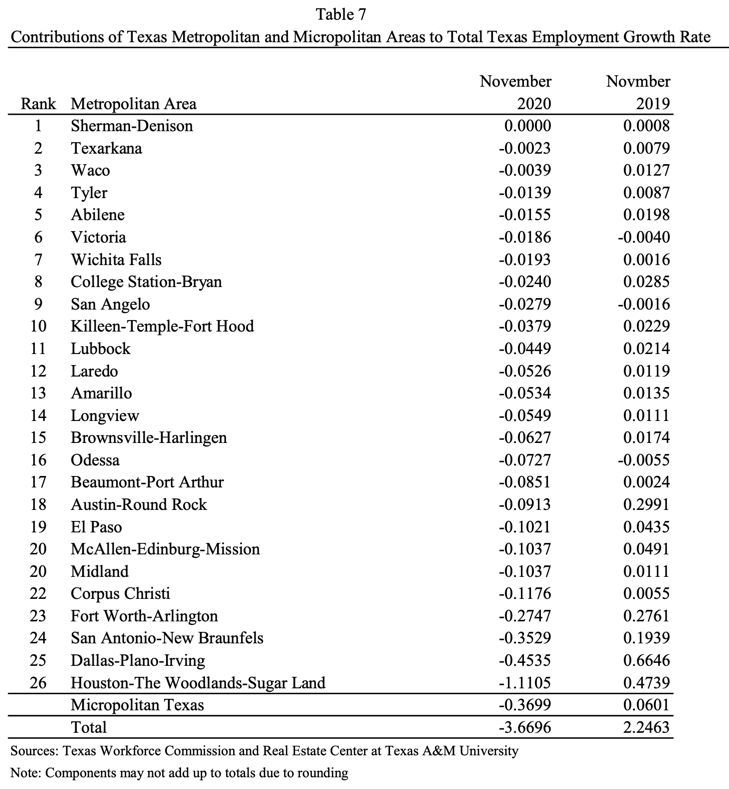 The contribution of each metro to the statewide employment growth rate is equal to the employment growth rate in that area multiplied by its share of Texas jobs. Table 7 shows Texas metros ranked by their contributions to Texas employment growth rates from February 2018 to February 2019. 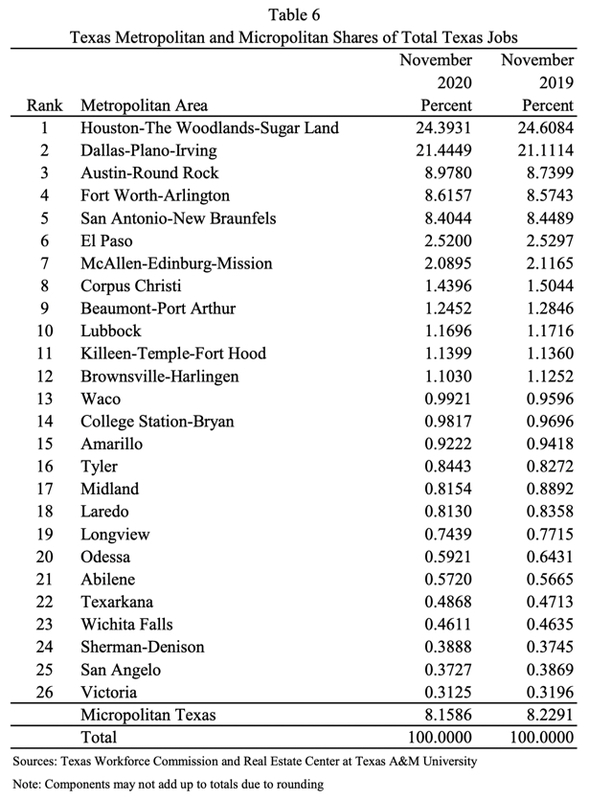 Dallas-Plano-Irving ranked first followed by Houston-The Woodlands-Sugar Land, Austin-Round Rock, San Antonio-New Braunfels, Fort Worth-Arlington, Midland, McAllen-Edinburg-Mission, and El Paso. Figures 90 to 115 (shown in full report)​ show trends in contributions of Texas metros to total Texas job growth rates. The state's actual unemployment rate in February 2019 was 3.9 percent. 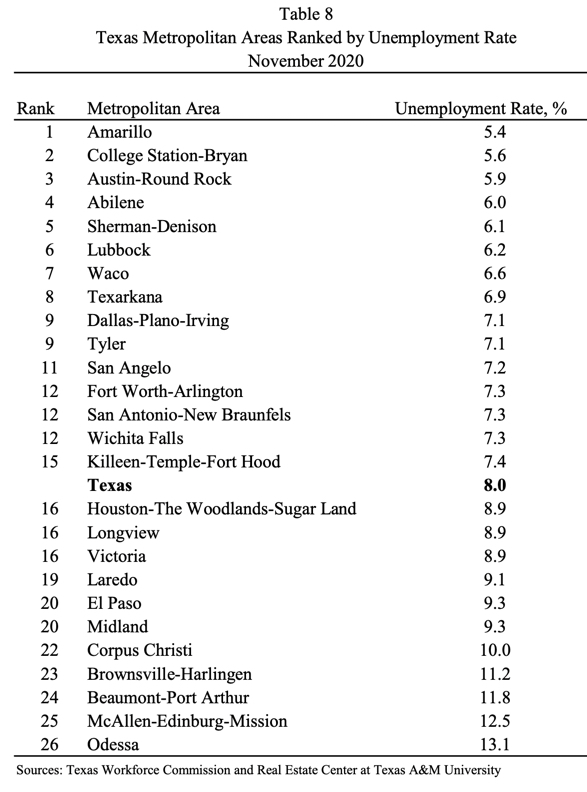 Midland had the lowest unemployment rate followed by Odessa, Amarillo, Austin-Round Rock, College Station-Bryan, Lubbock, San Angelo, and Sherman-Denison (Table 8). Table 9 shows annual growth rates of employment by industry in the six largest Texas metropolitan areas from February 2018 to February 2019. Houston-The Woodlands-Sugar Land's economy is currently driven by manufacturing; other services; professional and business services; education and health services; and mining and construction. Dallas-Plano-Irving is currently experiencing positive employment growth rates in the government sector and in all industries except information. San Antonio's economy is currently driven by leisure and hospitality, mining and construction, professional and business services, and education and health services. Fort Worth-Arlington's economy is currently experiencing job growth rates in the government sector and all industries except the information industry, professional and business services, mining and construction, and other services. Austin is currently experiencing positive employment growth rates in the government sector and in all industries except mining and construction. El Paso's economy is currently experiencing positive employment growth rates in the government sector and in all industries except manufacturing, financial activities, and professional and business services. To see the previous month's report, clic​​k here​. For the report from a year ago, click​ here​​​​​​​​​​​​​​​​​​​​​.